I announce, with sadness, that the Boston Bruins tied its series against my beloved Montreal Canadiens last night – in overtime. Overtime always brings tense moments in hockey, and especially in the post-season. It’s stressful and exciting, but it’s a game – in a sense, not quite real. What takes place in the good ol’ hockey game is very real for those on the ice and the bench, but it really doesn’t parallel life. There is a sense in which life is a game, but it’s definitely not a game when it comes to the concept of overtime. We simply don’t get overtime in life. True, some people will argue that after a tragic event in life – even one that may bring us near death – we feel as though we’ve been granted overtime, another of the proverbial nine lives of a cat. But the reality is that we are “playing in regulation” from the time we are born until the time we die. In other words, we don’t have extra time beyond what we are afforded, by God’s grace, in this life. In playoff hockey, the game can’t end until a tie has been broken, and if that requires overtime, they play until a goal is scored. But in real life, everything has to happen in regulation. Of course, many people understand this to mean that it’s important to cram in as much fun into life as possible, leading them to a hedonistic lifestyle. I won’t argue that having lots of fun in life is valuable, and even important for a complete and fulfilling life. But what matters more, I think, is that living life in “regulation time” involves investing in eternity – living beyond the here-and-now. Billy Graham, in his crusades years ago, used to talk about the immediate need to give our lives to Christ, because if we say we’ll wait until we’re on our death bed, we could be hit by a bus when leaving the arena! There was a bit of humour in that, but also a great truth: we never know when we are going to die. It could happen at any time, without warning. It’s of absolute importance that we invest in eternity while we are living, enjoying a personal relationship with God through Jesus Christ while we are able. The great benefit of a relationship with God while we live is that we get to enjoy (and share!) the blessings of life in Christ; it’s not just about getting a ticket to heaven when we die. There won’t be an overtime period; regulation time is all we’ve got. Have you made an eternal investment? Are you walking with Jesus as his disciple? ‘For God says, “At just the right time, I heard you. On the day of salvation, I helped you.” Indeed, the “righttime” is now. Today is the day of salvation‘ (2 Corinthians 6.2, NLT). Yesterday was a pretty patriotic day for Canadians. 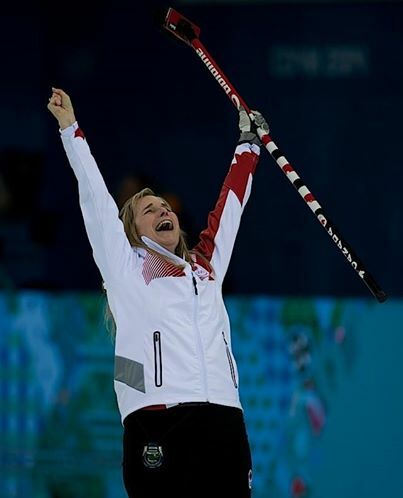 I dare say, even for those who are not sport or Olympic fans, there was a certain boasting in national pride when Canada’s Olympic Women’s Curling and Hockey teams earned gold medals in their respective disciplines. The men have a chance to follow suit in the coming days, and they have, no doubt, received inspiration from their hard-working female colleagues. While I wasn’t able to watch either game because of ministry commitments, seeing the looks on the athletes’ faces in photos posted after the games told the story. These competitors – including those who do not medal – work very hard to excel in their chosen sport. They go with a desire to win, and an intention to represent their country well. And, I dare say, every athlete wearing the Canadian flag has upheld the good name and the good reputation of their Home And Native Land. Those who win gold demonstrate by their faces just how much a dream-come-true it is for them to win. It’s a wonderful thing to witness in the middle of a long, hard winter back home. In interview after interview, Olympians articulate what a privilege and honour it is to represent Canada on the world stage. From competitors to coaches, those witnessing the games develop, or retain, a very favourable view of Canada. After all, when you live in such a great country, it’s easy to want to represent it well, as ambassadors. We followers of Jesus can learn something from our nation’s Olympians. Every day, from the moment we wake up until we fall asleep, we represent Jesus and his church. We represent Jesus when we speak to our spouses and children, our co-workers and bosses, our neighbours and friends, the strangers we encounter on the street and the clerks in the stores where we shop. Whether we wear an emblem of our faith commitment or not, we are God’s ambassadors in the world. When you serve such an amazing God, it’s easy to want to represent him well, as ambassadors. But because we are called to this important role every day, and not just for a couple of weeks out of four years, it can be hard for us to remember that we represent Jesus. Sometimes, we don’t represent him well. This is an area where we all can grow. It’s one of the many graces of being a disciple of Christ: we do not achieve perfection upon our profession of faith. We grow into our calling as faithful followers, looking more like Jesus every day. It’s a process whereby we are shaped and molded day after day, year after year, until we die (or Jesus returns). We are being formed as ambassadors for the Lord. Can we, like our Olympians, show on our faces, and by our actions, how amazing is our God? It needs to be an intentional act; it won’t happen on its own. And it can make a real difference: the atheistic philosopher of the 19th century, Friedrich Nietzsche, famously said to Christians that he would believe in their Redeemer when his people looked more redeemed! Sometimes, countenance makes all the difference. It’s about more than “Smile, God loves you”, though. It’s about actions that back up the claim that God loves people – the world – so much that he gave his only Son. Be intentional. We can do it! “So we are Christ’s ambassadors; God is making his appeal through us. We speak for Christ when we plead, ‘Come back to God!’” (2 Corinthians 5.20, NLT).